The Roanoke Colony (/ˈroʊəˌnoʊk/), also known as the Lost Colony, was the first attempt at founding a permanent English settlement in North America. It was established in 1585 on Roanoke Island in what is today's Dare County, North Carolina. The colony was sponsored by Sir Walter Raleigh, although he himself never set foot in it. The enterprise was originally financed and organized by Sir Humphrey Gilbert, who drowned in 1583 returning from a voyage to the fishing settlement at St. John's, Newfoundland. 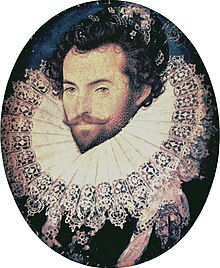 His half-brother, Sir Walter Raleigh, later gained Gilbert's charter from the Queen and subsequently executed its details through his delegates Ralph Lane and Richard Grenville, Raleigh's distant cousin. The Queen and Raleigh intended that the venture should provide riches from the New World. The queen's charter said that Raleigh was supposed to "discover, search, find out, and view such remote heathen and barbarous Lands, Countries, and territories ... to have, hold, occupy, and enjoy". The queen's charter also said that Raleigh was supposed to establish a base from which to send privateers on raids against the treasure fleets of Spain. :135 The purpose of these raids was to tell Spain that England was ready for war. The original charter basically told Raleigh to establish a military base to counteract the activities of the Spaniards. Raleigh himself never visited North America, although he led expeditions in 1595 and 1617 to South America's Orinoco River basin in search of the legendary golden city of El Dorado. On April 27, 1584, Raleigh dispatched an expedition led by Philip Amadas and Arthur Barlowe to explore the eastern coast of North America. 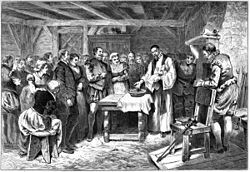 They arrived on Roanoke Island on July 4:32 and soon established relations with the local natives, the Secotans and Croatans. Barlowe returned to England with two Croatans named Manteo and Wanchese, who were able to describe the politics and geography of the area to Raleigh. :44–45 Based on the information given, Raleigh organized a second expedition, to be led by Sir Richard Grenville. Grenville's fleet departed Plymouth on April 9, 1585, with five main ships: Tiger (Grenville's), Roebuck, Red Lion, Elizabeth, and Dorothy. A severe storm off the coast of Portugal separated Tiger from the rest of the fleet. :57 The captains had a contingency plan if they were separated, which was to meet up again in Puerto Rico, and Tiger arrived in the "Baye of Muskito" (Guayanilla Bay) on May 11. While waiting for the other ships, Grenville established relations with the resident Spanish while simultaneously engaging in some privateering against them. :62 He also built a fort. Elizabeth arrived soon after the fort's construction. :91 Grenville eventually tired of waiting for the remaining ships and departed on June 7. The fort was abandoned, and its location remains unknown. Despite this incident and a lack of food, Grenville decided to leave Ralph Lane and 107 men to establish a colony at the north end of Roanoke Island, promising to return in April 1586 with more men and fresh supplies. The group disembarked on August 17, 1585, and built a small fort on the island. There are no surviving renderings of the Roanoke fort, but it was likely similar in structure to the one in Guayanilla Bay. Grenville in the Tiger on only his seventh day of sail captured (after a three-day battle) a rich Spanish galleon, Santa Maria de San Vicente off Bermuda which he took with him as a prize back to England. In 1587, Raleigh dispatched a new group of 115 colonists to establish a colony on Chesapeake Bay. They were led by John White, an artist and friend of Raleigh who had accompanied the previous expedition to Roanoke, and was appointed governor of the 1587 colony. White and Raleigh named 12 assistants to aid in the settlement. They were ordered to stop at Roanoke to pick up the small contingent left there by Grenville the previous year, but when they arrived on July 22, 1587, they found nothing except a skeleton that may have been the remains of one of the English garrison. When they could find no one, the master pilot Simon Fernandez refused to let the colonists return to the ships, insisting that they establish the new colony on Roanoke. :215 His motives remain unclear, however, and new evidence offered by author Brandon Fullam indicates not only that Fernandez had good reason for his actions, but that the decision to alter the Chesapeake Bay destination had already been agreed to prior to their arrival at Roanoke. Born in 1560, Thomas Harriot entered Raleigh's employment in the early 1580s, after graduating from the University of Oxford. Harriot may have been among the men of Arthur Barlowe's 1584 expedition of the colony. He trained the members of Raleigh's first Roanoke expedition in navigational skills and eventually sailed to Roanoke with the second group of settlers, where his skills as a naturalist became particularly important along with those of painter and settlement leader John White. Between their arrival in Roanoke in April 1585 and the July 1586 departure, Harriot and White both conducted detailed studies of the Roanoke area, with Harriot compiling his samples and notes into several notebooks that did not survive the colony's disappearance. Harriot also wrote descriptions of the surrounding flora and fauna of the area, which survive in his work A Brief and True Report of the New Founde Land of Virginia, written as a report on the colony's progress to the English government on the request of Raleigh. Viewed by modern historians as propaganda for the colony, this work has become vastly important to Roanoke's history due to Harriot's observations on wildlife as well as his depictions of Indian activities at the time of the colony's disappearance. Harriot reports that relations between the Roanoke Indians and the English settlers were mutually calm and prosperous, contradicting other historical evidence that catalogs the bloody struggles between the Roanoke Indians and both of Raleigh's commanders, Sir Richard Grenville and his successor, Ralph Lane. Harriot recounts little to none of these accounts in his report to England and does not mention the disorderly state of the colony under either Grenville's or Lane's tenure, correctly assuming these facts would prevent Roanoke from gaining more settlers. Harriot's text did not reach England, or the English press, until 1588, by which time the fate of the "Lost Colony" was sealed in all but name. There was one final expedition in 1603 led by Bartholomew Gilbert with the intention of finding Roanoke colonists. Their intended destination was Chesapeake Bay, but bad weather forced them to land in an unspecified location near there. The landing team, including Gilbert himself, was killed by a group of Native Americans for unknown reasons on July 29. The remaining crew were forced to return to England empty-handed. Once the Jamestown settlement was established in 1607, efforts were undertaken by the English to acquire information from the Powhatan tribe about Roanoke. The first definitive information concerning the fate of the Lost Colony came from Captain John Smith, leader of the Jamestown Colony from 1608 to 1609. According to chronicler Samuel Purchas, Smith learned from Chief Powhatan that he had personally conducted the slaughter of the Roanoke colonists just prior to the arrival of the Jamestown settlers because they were living with the Chesepians, a tribe living in the eastern portion of the present-day South Hampton Roads sub-region who were related to the Pamlico tribe in Carolina and who refused to merge with the Powhatans. :21–24 This shocking information was reported to England and by the spring of 1609, King James and the Royal Council were convinced that Chief Powhatan was responsible for the slaughter of the Lost Colony. The second source of Chief Powhatan's involvement was William Strachey, Secretary of the Jamestown colony in 1610–11. Strachey's The Historie of Travaile Into Virginia Britannia seemed to confirm Smith's report and provided additional information: the colonists had been living peacefully among a group of natives beyond Powhatan's domain for more than twenty years when they were massacred. Furthermore, Powhatan himself seemed to have directed the slaughter because of prophecies by his priests that he would be overthrown by people from that area,:101 and he reportedly produced several English-made iron implements to back his claim. The information from these two sources, John Smith and William Strachey, provides the basis for the traditional view that the Lost Colony was slaughtered by Chief Powhatan, and versions of the Powhatan-Lost Colony-slaughter scenario have persisted for more than 400 years. However, no bodies were found and no archaeological evidence has been found to support this claim. Furthermore, recent re-examination of the Smith and Strachey sources advanced by author and researcher Brandon Fullam has suggested that the massacre described by Powhatan was actually of the 15 people left behind by the first Roanoke expedition, leaving the fate of the second colony still unknown. As per Smith's and Strachey's reports, Dr. David Beers Quinn theorized that the colonists moved north to integrate with the Chesepians that Chief Powhatan claimed to have killed. To make the journey northward, Quinn believed that they used the pinnace and other small boats to transport themselves and their belongings. Naturally, if that were the mode of transportation, the colonists could have gone to live in other locations as well. The so-called "Zuniga Map" (named for Pedro de Zúñiga, the Spanish ambassador to England, who had secured a copy and passed it on to Philip III of Spain:112), drawn about 1607 by the Jamestown settler Francis Nelson, also gives credence to this claim. The map states "four men clothed that came from roonock" were living in an Iroquois site on the Neuse. William Strachey wrote that, at the Indian settlements of Peccarecanick and Ochanahoen, there were reportedly two-story houses with stone walls. The Indians supposedly had learned how to build them from the Roanoke settlers. :222 In both cases, as stated above, it is equally possible that these were survivors of Chief Powhatan's attack on the first Roanoke colonists. A farther Confirmation of this we have from the Hatteras Indians, who either then lived on Ronoak-Island, or much frequented it. These tell us, that several of their Ancestors were white People, and could talk in a Book, as we do; the Truth of which is confirm'd by gray Eyes being found frequently amongst these Indians, and no others. They value themselves extremely for their Affinity to the English, and are ready to do them all friendly Offices. It is probable, that this Settlement miscarry'd for want of timely Supplies from England; or thro' the Treachery of the Natives, for we may reasonably suppose that the English were forced to cohabit with them, for Relief and Conversation; and that in process of Time, they conform'd themselves to the Manners of their Indian Relations. Fred Willard and Phillip MacMullan believe that the colonists along with the Croatans relocated to villages along the Alligator River in an area known as "Beechland", slightly inland from Roanoke Island. Archeological remains of settlements have been discovered in the area, including coffins with Christian markings on them where there had been no previous record of a grave site, but their hypothesis is mostly based on oral histories and also lacks any definitive evidence. From 1937 to 1941, a series of inscribed stones was discovered that were claimed to have been written by Eleanor Dare, mother of Virginia Dare. They told of the travelings of the colonists and their ultimate deaths. Most historians believe that they are a fraud, but there are some today who still believe at least one of the stones to be genuine. The very first one is sometimes regarded to be different from the rest, based on a linguistic and chemical analysis, and could possibly be genuine. In May 2011, Brent Lane of the First Colony Foundation was studying the Virginia Pars Map, which was made by John White during his 1585 visit to Roanoke Island, and noticed two patches where the map had been corrected. The patches are made of paper contemporaneous with that of the map. Lane asked researchers at the British Museum in London, where the map has been kept since 1866, what might be under the patches, sparking a research investigation. On May 3, 2012, at Wilson Library of the University of North Carolina at Chapel Hill, members of the Foundation and representatives of the museum announced the discovery of "a large, square-shaped symbol with oddly shaped corners." This symbol, presumed to represent a fort, is visible when the map is viewed on a light box. Some scholars speculate that the colonists relocated to that location, on what is now called Salmon Creek in the Bertie County community of Merry Hill. The Scotch Hall Preserve golf course community was planned on the site, but it has not been fully developed. The discovery of new information on the map led to more study of artifacts previously found, as well as additional digs in 2012 and 2014. In 1993, Hurricane Emily caused numerous relics to appear, and David Phelps of East Carolina University later began digging in the area and found evidence the settlers lived with the native people. In 1998, East Carolina University organized "The Croatoan Project", an archaeological investigation into the events at Roanoke. The excavation team sent to Hatteras Island uncovered what they believed to be a 10 karat (42%) gold 16th-century English signet ring, gun flints, and two copper farthings (produced sometime in the 1670s) at the site of the ancient Croatan capital, 50 miles (80 km) from the old Roanoke Colony. Genealogists were able to trace the lion crest on the signet ring to the Kendall coat of arms, and concluded that the ring most likely belonged to one Master Kendall who is recorded as having lived in the Roanoke Colony from 1585 to 1586. If this is the case, the ring represents the first material connection between the Roanoke colonists and the Native Americans on Hatteras Island. However, archaeologist David Phelps did not have the ring tested, and Charles Ewen, who continued Phelps' work after Phelps retired, had the ring tested and found the ring was brass. Ewen announced his findings in April 2017. Mark Horton of the University of Bristol said he was not convinced that this news proved the ring did not date to the 16th century. It is also believed that the reason for the extreme deficiency in archaeological evidence is due to shoreline erosion. Since all that was found was a rustic looking fort on the north shore, and this location is well-documented and backed up, it is believed that the settlement must have been nearby. The northern shore, between 1851 and 1970, lost 928 feet (283 m) because of erosion. If in the years leading up to and following the brief life of the settlement at Roanoke, shoreline erosion was following the same trend, it is likely the site of the dwellings is underwater, along with any artifacts or signs of life. Archaeological investigations continue to find tantalizing clues and funding is being sought to continue recent excavations. The researchers concluded that the settlers of the Lost Colony landed at Roanoke Island in the summer of the worst growing-season drought in 800 years. "This drought persisted for 3 years, from 1587 to 1589, and is the driest 3-year episode in the entire 800-year reconstruction," the team reported in the journal Science. A map shows that "the Lost Colony drought affected the entire southeastern United States but was particularly severe in the Tidewater region near Roanoke [Island]." The authors suggested that the Croatan who were shot and killed by the colonists may have been scavenging the abandoned village for food as a result of the drought. The Lost Colony of Roanoke DNA Project was founded in 2007 by a group led by Roberta Estes, who owns a private DNA-testing company, in order to solve the mystery of the Lost Colony using historical records, migration patterns, oral histories and DNA testing. The project used Y chromosome, Mitochondrial DNA and Autosomal DNA. As of 2016[update], they have not yet been able to positively identify any descendants of the colony. ^ Dolan, Robert; Kenton Bosserman (September 1972). "Shoreline Erosion and the Lost Colony". Annals of the Association of American Geographers. 62 (3): 424–426. doi:10.1111/j.1467-8306.1972.tb00875.x. ^ Stahle, David W.; et al. (1998). "The Lost Colony and Jamestown Droughts". Science. 280 (5363): 564–567. doi:10.1126/science.280.5363.564. PMID 9554842. Hariot, Thomas, John White and John Lawson (1999). A Vocabulary of Roanoke. Evolution Publishing: Merchantville, NJ. ISBN 1-889758-81-7. CS1 maint: Multiple names: authors list (link) This volume contains practically everything known about the Croatan language spoken on Roanoke Island.